Horror For The Holidays: Meet The Anti-Santa The Krampus is a character from European Alpine folklore. It stands on two hooves, has horns growing out of its skull and carries a basket to haul away naughty children. For those who get sick of the saccharine season, a good Krampuslauf is just the thing. A Krampus roams the streets during a "Krampuslauf" near Merano, Italy, last weekend. People around America are also taking up the European Alpine folklore tradition, dressing like the creature who steals naughty children around Christmastime. 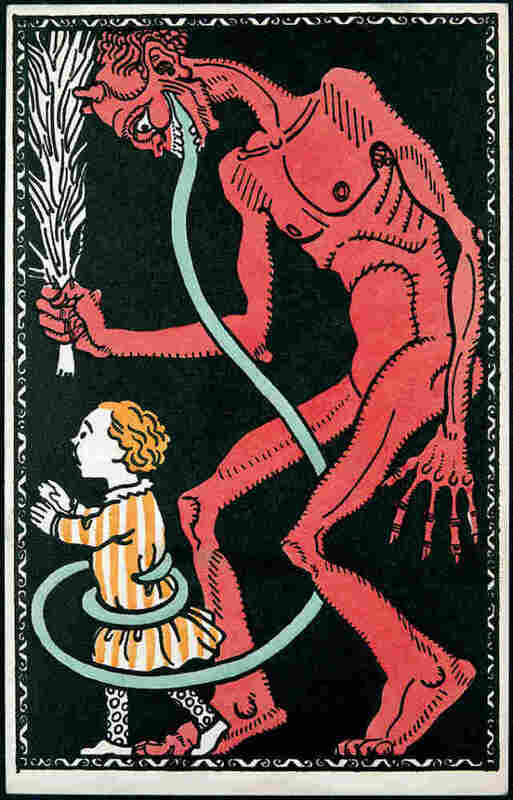 An illustration of the Krampus from an early 20th-century postcard. For generations the Christmas season has been infused with sweetness, but some families in Philadelphia are adding a dash of horror. There are no Christmas lights up at Janet Finegar's house in the Northern Liberties neighborhood of Philadelphia. She does not deck her halls with boughs of holly. Instead, hundreds of rib bones leftover from a neighborhood barbecue hang on a clothesline strung across her backyard. They're bleaching in the sun. "They have been scraped, boiled, scraped again, bleached and are now strung on strands and hanging out to dry," she says. "They smell. Rib bones, as it turns out, are incredibly nasty." She will drape the bones over herself and wear them like a grisly tunic. It's her Krampus costume. The Krampus is a character from European Alpine folklore, common in Austria and Switzerland. The creature stands on two hooves and has horns growing out of its skull. An extremely long tongue hangs out of its mouth, and it carries a basket to haul away naughty children. For hundreds of years, the Krampus and Saint Nicholas have worked a kind of good cop-bad cop routine. Saint Nick rewards the good children; Krampus terrorizes the bad. "If everything is sweet and beautiful and lovely and the most wonderful time of the year, some people, like me, start to get a little nauseated, want a little salt to go with the sugar," she says. "I think there [are] a lot of people out there who enjoy the idea of having a little salt." Around the country, there are Krampus parties and club nights in December, where people dress in leftover Halloween costumes to drink and dance. 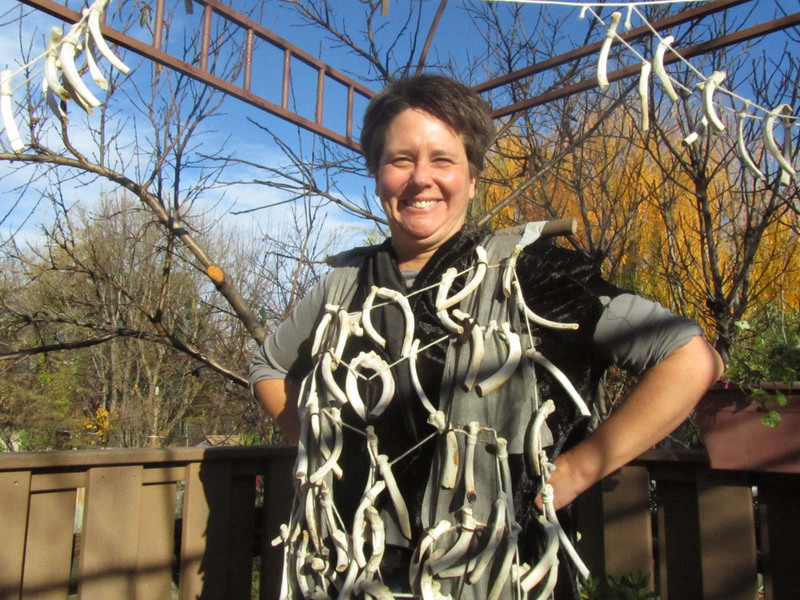 Janet Finegar shows off her costume of rib bones prepared for the Krampuslauf in Philadelphia. She'll be one among many parade participants dressed as the mythical Christmas demon Krampus. Finegar is helping to organize a traditional Krampuslauf: a procession of people dressed as Krampus, walking through the streets with noisemakers. 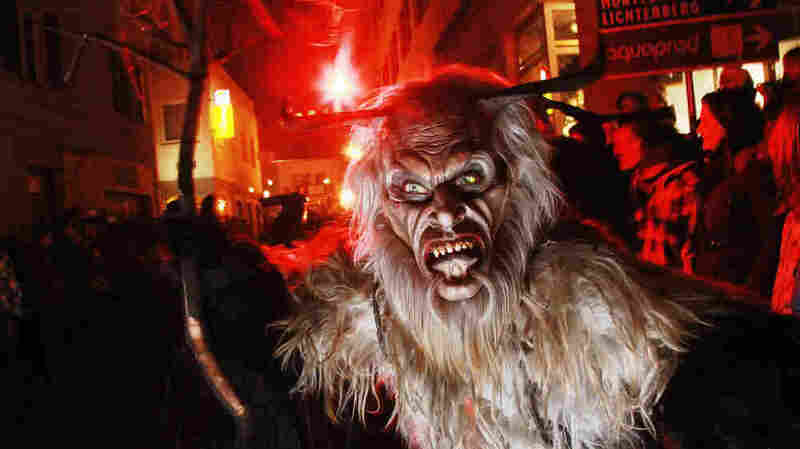 The idea for the Krampuslauf in Philadelphia came from Amber Dorko Stopper, a mother of two. "Spooky and scary has had a place in Christmas historically — A Christmas Carol is a ghost story with scary things in it," she says. "I hate to see everything get watered down because I remember how much fun those things are." Krampus parades are rare in the United Sates. Last year, Joseph Ragan organized one in Portland, Ore., as a reaction to the way Christmas dominates the winter season. "Of all the 10,000 holidays that can be celebrated, we just have this one particular version of this one particular holiday really shoved down our throats for months at a time — in the most saccharine form," he says. Consider that Christmas muzak you hear in grocery stores before Thanksgiving. That really annoys Stopper. She's a fan of horror movies, and enjoys the folk tales of Krampus stealing children, throwing them into icy rivers or eating them alive. "I realized really quickly how that was not popular in this time period. As a parent of small children that was seen as suspicious behavior almost immediately," she says. "Everything is so soft-pedaled these days with kids to the point where you're not showing any kind of conflict to your kids, much less folklore." "Since both of our children are adopted, we're a little extra sensitive to talking about being taken away," Stopper says. "But we did tell them that, 'He'll take you to his house, you'll have to eat spicy vegetables and watch boring adult television — and then he'll bring you home.' "
Hordes of Krampus demons paraded through the 2010 Krampuslauf in Graz, Austria.